•A partner will stop at nothing to keep ancient artifacts his and his alone. Whatever it takes, there will be no sharing of the fame he’ll receive. Deep below a quaint street in London there’s a secret room. A sarcophagus has rested there for a thousand years. When an astonishing set of diaries is found, secrets lost for centuries are revealed. Even the journals themselves are amazing. They were written by a monarch whom history says never existed. 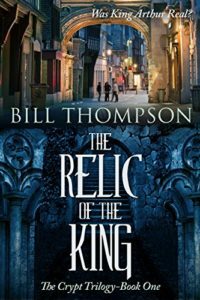 Roberto Maas, a businessman who’s not what he appears to be, searches a medieval crypt for answers. You’d expect to find bodies in a crypt, but along with ancient corpses there are modern ones too. Roberto must be wary – his psychotic partner has dark secrets of his own. The mystery unravels and time begins to run out. Roberto Maas races to learn what the discoveries beneath the ancient city really mean.